First English’s music ministry is blessed by a wonderful group of musicians who guide the congregation in glorifying God through music and song. Instrumentalists bring their talents to worship throughout the year, especially during the summer music series. 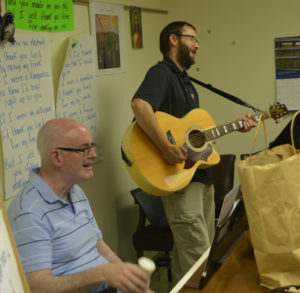 Music is also a key element of special seasonal ministries such as Vacation Bible School. Whether students, amateur, or professional–there are ways to participate! The FELC choir welcomes singers in its pursuit of glorifying God and bringing the beauty of music to worship. Under the direction of Harry Cunningham, the choir sings a variety of mostly traditional choral music. Rehearsals are held weekly on Thursdays at 7:30 p.m. in the sanctuary. The choir sings at 11:00 AM on Sundays and at special services throughout the year.